Sometimes it really is the simplest things that make me the happiest. In our home during October and November, the days are always filled to overflowing with activities; birthdays, anniversaries, school events, commitments at work, finding a cure for cancer, establishing world peace, etc, etc, etc. The weeks zip by and the weekends disappear in the blink of an eye. Before I can say “pass the gravy, please”, Thanksgiving is knocking at the door and Christmas is just a few blocks away. I find that it’s during these busiest of times that the little things mean the most; like taking just a few extra minutes at night to brush my daughter’s hair because she is in the middle of telling me all about the latest boy/girl scandal at school; or giving in to that lazy impulse and having popcorn and ice cream for dinner while snuggled under blankets, catching the latest episode of Glee; or maybe, just this once, leaving the to-do list in the bottom of my purse, piling kids and dog into the car, and heading to the park to gather pine cones. With Thanksgiving on the calendar next week, I find myself compiling my mental list of things I am always and forever grateful for. Right after family, friends and home come those little, stolen “perfect moments” that give me a warm glowy feeling from the top of my head to the tips of my toes. And right after that comes the Dog (capital D), who keeps my feet warm and cleans the kitchen floor every night after dinner. 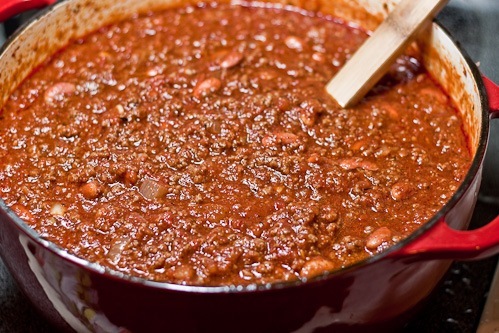 In the spirit of warm, glowy feelings, I will share with you my recipe for the ultimate comfort food; chili. Nothing too fancy or too complicated, just combine ingredients in your favorite comfort food pot, put it on the stove and forget about it until the house starts to smell really good and your tummy starts to grumble. This is a snapshot of an ever-evolving recipe, filled with love, warmth and a generous pinch of “me” added in for good measure. Did I mention the beer? 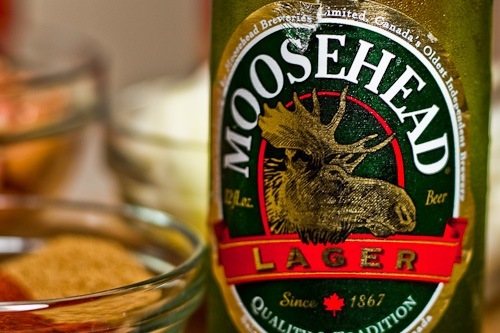 Canadian beer, of course! 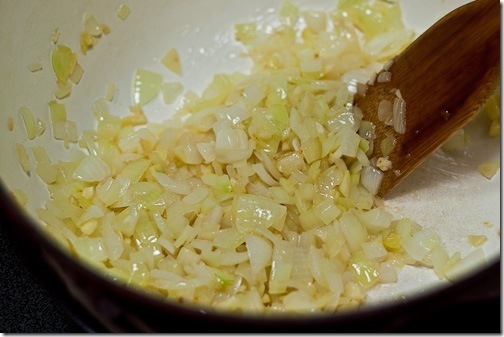 Sauté the onions and garlic over medium heat in a Dutch oven until translucent, about 5 minutes. Add the chili powder, cumin, chipotle chiles, oregano, thyme, coriander and chipotle chili powder. Cook for another few minutes, until the spices are fragrant. 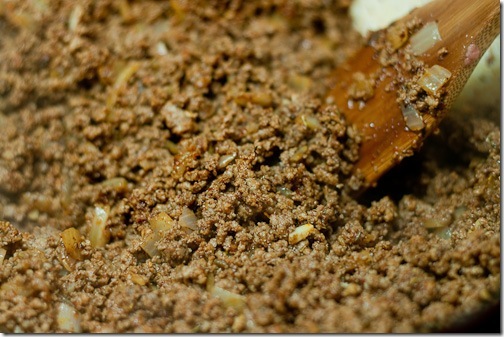 Add the beef and cook over medium-high heat until browned, about 10 minutes. Stir in the tomato paste and cook for a few more minutes. 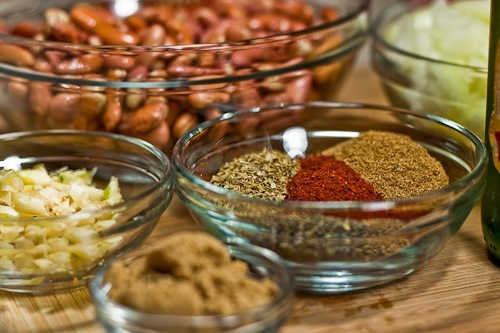 Add the crushed tomatoes, beer, beef broth or stock, brown sugar and the kidney beans. 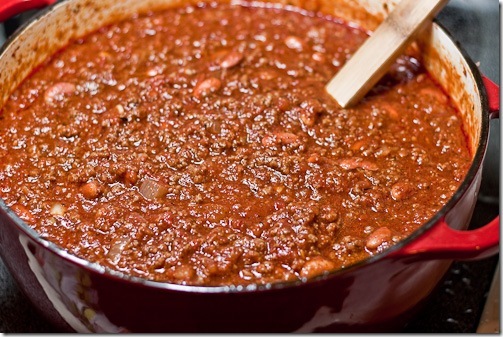 Reduce heat to medium low and simmer partly uncovered until chili has thickened, 1½ to 2 hours. Taste for salt and adjust as needed. Serve with crackers, grated cheese and vinegar or lime juice to add a splash of tang, if desired. love your chili! the spice and beer totally flavours it up! 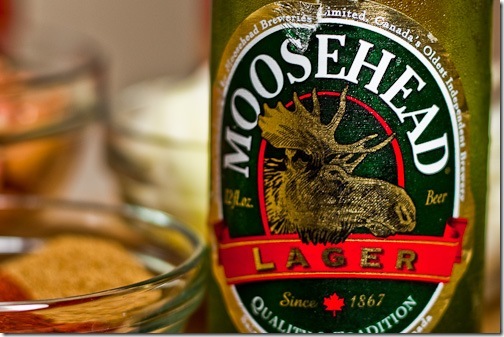 Canadian beer… I should have known! Yum, yum, just plain yum! This chili sounds awesome! The addition of lager and brown sugar are excellent here! The beer in this chili sounds great! I have been craving a warm bowl of chili…..love having all the left overs too! Chili looks great and very good photography. Great recipe! Perfect for a gloomy and rainy day. Jeff: So go eat something. There are leftovers in the refrigerator, silly husband of mine. Year on the Grill: I agree. It’s one of those “warm you up from the inside” foods. Lululu: Glad you like it! Natasha: I agree. I like a lager better than ale. I’ve tried ale, but I feel it has some bitter undertones that can throw off the flavors. Marla: The leftovers are even better! Chris: Two things: First, if I were half as clever as you, I would have called this Moose Head Chili, because I think it’s funny, and because there is nothing wrong with misleading advertising if it’s funny, right? 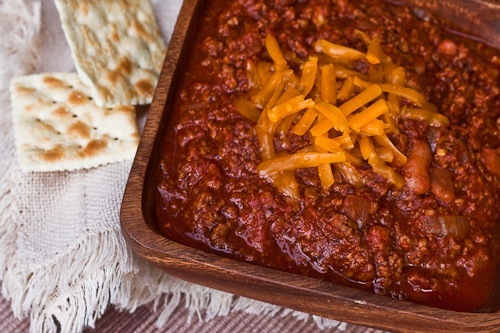 Second, admit it; now that you’ve put it down in writing you’re thinking about making moose chili. C’mon, admit it. Noelle: It is, and thanks! I made it on Friday night for my notoriously picky boyfriend and friends. Everyone was in love. Not only was it easy to make after a long, cold, rainy work day, but it was super delicious! I’ve never made chili before but I’m guessing this will be a more regular dish in my house. Diana: I’m so glad you made it, and even more glad you enjoyed it! This is one of the first dishes I think of making once the weather starts getting a little nippy, and it’s always appreciated by family and friends. 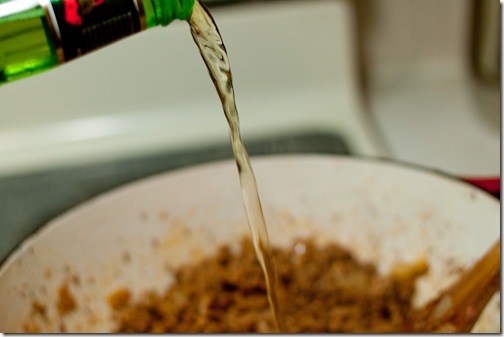 I’ve lived this long and never tried making chili with beer? Huh??? How is that possible? Love the link to the BACFF Cookbook – thanks for the support!! !